What if I tell you that colorblindness can be treated by just logging onto amazon.com and buying colorblindness-correcting glasses for just over $300? Yes, this has been made possible by a neurobiologist, Mark Changizi and his friend Tim Barber. Their research institute, 2AI Labs, invented a pair of glasses with filters that just happen to cure colorblindness. Logic behind this revolutionary innovation is simple. Humans perceive changes in skin color (to tell whether someone is unhealthy, scared, angry, joyful etc.) through their ability to detect oxygenation and hemoglobin changes under the skin. These filters developed by them sharpen the ability to see the red-green or blue-yellow parts of the spectrum thereby enhancing to view these changes with better precision. It simply betters what the human eye does naturally. They have developed three types of lenses: Oxy-Iso, Hemo-Iso, and Oxy-Amp. Where Oxy-Amp lens augments the perception of blood oxygenation, it is the Oxy-Iso lens that isolates and enhances the red-green part of the spectrum and hence cures colorblindness. These glasses have several potential applications in medical field. Oxy-Amp is a significant boost to the healthcare providers who could see the veins more properly while drawing blood and hence reduce medical errors. You can have these glasses at your doorstep through amazon.com. 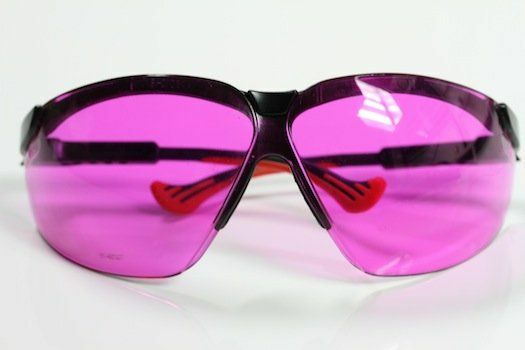 In addition to this channel, talks are going on with companies such as Oakley & Ray-Ban to put this technology into sunglasses enabling it to reach more buyers. And their use is just not limited to the medical field. The most interesting use of these glasses has been in getting hold of ‘bluffers’ at the game of poker. A mirrored O2Amp lens has been designed especially for poker players (ofcourse to better see the flush on your face when you bluff). So just be cautious next time when you are at the poker or gambling table and you see another person with savvy pink or red colored glasses gazing at you. I can think of many other uses for this incredible technology. What about you? Do share your views on where this can be used for apt use. Next: Next post: Whats trending in Healthcare?